Have you fully identified your data that could be at risk? Are you confident that you have adequate controls and security to protect this data? Is your IT department current on daily evolving threats? Do you have a system intrusion disaster recovery plan? Most businesses have taken steps to secure their computer systems but the reality is that no system is impenetrable. Recovering from a breach can be expensive and time consuming–determining the cause and the extent of the breach, complying with notice laws, handling public relations, resolving lawsuits from customers and clients–can truly destroy a business! As businesses are forced to become technologically savvy to compete in today’s marketplace, they may not be aware of emerging risks that could threaten the bottom line, or more importantly the reputation of their businesses. websites with or without an e-commerce component. unauthorized access to your system by a third party, hacker, etc. When one of these happens to your business, the cost will be substantial–both in expenses and loss of reputation. So the question becomes, why wouldn’t you transfer the financial risk to another party–an insurance carrier? For 15 years, the Computer Science Institute (CSI) has conducted an annual survey of IT security professionals across the United States. 41.1% of respondents experienced at least one cyber security incident during the survey period. 22% of respondents said at least some of those incidents were targeted attacks aimed specifically at their company. 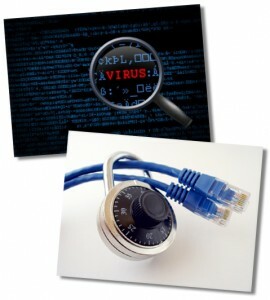 67.1% experienced a malware infection. Only 8.7% said security incidents included financial fraud. 40.9% said at least some financial losses due to cyber security threats were caused by malicious insiders. 60.5%, said some losses were due to the accidental actions of their own employees. Only 27.5% reported any cyber intrusions to law enforcement and just 3.6% reported incidents to the public media. Belief that law enforcement could not help, that the incidents were too small to report, and fear of negative publicity, were the top reasons. 2010/11 CSI Computer Crime and Security Survey, used with the permission of the Computer Security Institute, GoCSI.com. The phrase “Cyber Breach” has become part of our lexicon in recent years and these breaches have become very expensive for both business and the general public. 45% of reported cyber breaches cost between $250,000 and $1,000,000 to remediate. These large companies have full IT departments that monitor for this type of illegal activity and yet they still were breached. For a small business it could be as simple as an employee’s laptop or USB drive being stolen or misplaced to a computer malfunction that distributes customer information in a mass email or posts it to a web site. These can be accidental or malicious, generated by an employee, or your business system could be hacked and/or a virus injected. A hacker stole all of a company’s customer data then blackmailed the company by threatening to post it publicly or sell it to a competitor. The Nature Conservancy in Arlington, VA lost the records of 14,000 current/past employees and their dependents. The data loss occurred when an HR employee’s laptop was infected with spyware while visiting a sports-related website. This type of web-browsing activity is very common in the workplace. A Nevada woman purchased a used computer from a pharmacy discovering that it still contained the prescription records including names, addresses, social security numbers and all medicines of the pharmacy’s customers. As vigilant as you are to protect yourself, the criminals that conduct this type of activity are always one step ahead. One way you can mitigate the damage is to have a cyber liability policy in place. Businesses of all sizes have some level of these exposures and breaches placing their financial assets and reputation at risk. The losses resulting from cyber breaches are typically excluded by standard commercial liability policies as they respond to claims arising out of bodily injury to others or damage to tangible property. Damages arising out of cyber activities do not normally meet a general liability policy’s definition of bodily injury nor result from a property policy’s covered causes of loss. Some carriers offer an endorsement to their Commercial Package or Businessowner policies to extend some Cyber Liability protection. However, often the limits offered are lower than needed and the coverage is not as extensive as a stand alone Cyber Liability policy. Coverage is provided by a limit per incident or claim and subject to a policy aggregate and deductible. The premium is determined based on your specific business activities and thus loss potential, limits, and deductible elected, etc. A benefit of having a policy is that it enhances your financial stability and gives peace of mind as you navigate business in the necessary but unclear digital universe.